India's Bihar state is off the beaten track for most visitors, but it's loaded with religious and cultural history. The Bihar government has been putting significant effort into drawing visitors to the state. The main focus has been on promoting Bihar's many religious sites, of which the Buddhist ones are most prominent. 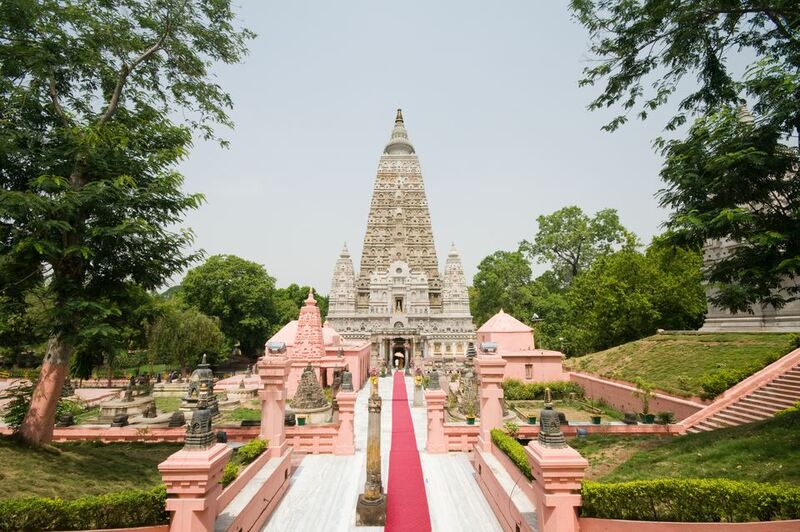 Important sites for Buddhists include Bodhgaya's Mahabodhi Temple, where Buddha supposedly meditated, while the Mahavir Mandir temple in Patna, the capital, is revered by Hindus. Bihar is where the Buddha began his journey to enlightenment, and it's possible to follow in his sacred footsteps. The most important Buddhist pilgrimage place in the world is Bodhgaya, where the Buddha became enlightened while meditating under a bodhi tree. The magnificent Mahabodhi Temple, which is a UNESCO World Heritage Site, marks the spot. It's a sprawling and serene place to spend some time. Bodhgaya also has many Buddhist monasteries and temples, with varying architectural styles. If you're interested in Buddhism, you'll find plenty of courses and retreats on offer there. Although it's not far from Bodhgaya, Gaya couldn't be more different. Foreign tourists may wish to skip this rather noisy and unappealing town, which is a significant center for Hindu pilgrims. The main attraction is the Vishnupad Temple, with its massive footprint of Lord Vishnu imprinted on the rock. Unfortunately, non-Hindus aren't allowed inside the temple. Pilgrims come to Gaya to perform the holy "Pinda Dan" ritual for their deceased elders, which Lord Ram and his wife Sita are said to have carried out there. The ceremony is believed to liberate the souls of the dead, as well as provide salvation and release from rebirth. An essential attraction on Bihar's Buddhist Circuit, the extensive ruins of Nalanda University date back to the fifth century, making it one of the world's oldest universities. Nalanda was a significant center for Buddhist learning with an estimated 10,000 monks and students. It survived until the twelfth century​ when it was ransacked by Muslim invaders and its library set on fire. More than nine million manuscripts are thought to have been destroyed. The highlight of the ruins is the pyramid-shaped Stupa of Sariputra, flanked by steps and sculptures. The ruins were listed as a UNESCO World Heritage Site in 2016, making it the second one in Bihar. The ruins can be easily visited from nearby Rajgir. Regularly shared jeeps run between the two places, although they do get crowded. Lord Buddha spent some years at Rajgir after becoming enlightened. Although a popular pilgrimage destination for Buddhists, Hindus, and Jains, Rajgir doesn't get as much attention from foreign tourists as it deserves. A couple of days can be spent exploring the area, which has many historical sites, caves, shrines, and temple remains. One of the most popular things to do is take the aerial tramway uphill to the Vishwa Shanti Stupa. Walk back down the hill and visit Vulture's Peak, where Buddha used to preach to his disciples. The view is noteworthy. Also of interest are the remnants of the ancient stone Cyclopean wall, constructed by Mauryan rulers, that used to surround Rajgir. Hot springs with medicinal properties attract many visitors, but they're dirty and poorly maintained. An annual Rajgir Mahotsav classical music and dance festival takes place at the end of December. Vaishali is another important Buddhist and Jain pilgrim destination. Lord Buddha frequently visited the city, which was large and prosperous, and preached his last sermon at nearby Kolhua. Emperor Ashoka built one of his famous lion pillars there, in the 3rd Century BCE, to commemorate the occasion. Many people also believe that Lord Mahavira, the 24th, and last Jain teacher, was born in the area, although this is debated. The annual Sonepur Fair is an authentic rural fair that combines spirituality with elephant, cattle, and horse trading. It takes place in late November at Sonepur, around 45 minutes from the capital city of Patna. Traditionally known as a cattle fair, the Sonepur Fair now has a more commercial focus with the aim of attracting both domestic and international tourists. Don't miss the captivating spectacle of ​tantriks, pilgrims, and elephants taking an auspicious holy bath in the river at sunrise on Karthik Purnima! If you're traveling from Bodhgaya to Varanasi in Uttar Pradesh, it's worth stopping at Sasaram to see Emperor Sher Shah Suri's mausoleum. In ancient times, before Mughal rulers shifted it to Delhi, Bihar used to be the center of power. Many Sufi saints came to the region and attracted pilgrims with their liberal mindsets and humanistic preaching. You'll find numerous sacred tombs of Muslim rulers in Bihar. The one belonging to Emperor Sher Shah Suri, sitting in the middle of a large artificial lake, is among the most elaborately constructed. You might know Karim's from Delhi, but that's not the only place you can eat this restaurant's revered kebabs. Now, Karim's has opened an outpost in Patna, where you can enjoy the same tikka rolls, mutton kebabs, and Mughlai staples as the original location in Jama Masjid. Although now in ruins, Navlakha Palace, located in Rajnagar near Madhubani in Bihar is worth a visit for the architectural beauty. The palace, built by Maharaja Rameshwar Singh was all but destroyed in an earthquake in 1934. The palace complex is comprised of gardens, pond, and temples. There is a museum on the first floor which has beautiful architectural features in the ceilings and doorways. The exhibits inside include artifacts collected by the Maharaja including toy cars, pictures, a library of books, trophies, and more. Vishwa Shanti Stupa, known as the World Peace Pagoda, is located in Rajgir. One of the 7 Peace Pagodas built in India, this example of Japanese-style architecture is a must-visit. The pagoda was built in 1969 and has four statues of Buddha that represent the four important phases of Buddha’s life—birth, enlightenment, teaching, and death. Birders will enjoy a trip to Kanwar Lake, India’s largest freshwater oxbow lake. Located in Begusarai, the Kanwar Lake Bird Sanctuary is a stopping place for over 60 species of migratory birds. The best time to visit is from October through the end of March and if you want to see the green plants thriving, the monsoon season is a good time. The four Barabar Caves, in the hills 24 kilometers north of Gaya, are said to be the oldest rock-cut caves in India. The caves and the artifacts found there date back to the Mauryan Empire (322–185 BCE) and evidence of Buddhist and Jain art are found there as well. The fascinating caves have designs and inscriptions all over the walls and ceilings. The monastery and temple are just a kilometer away from the Mahabodhi Temple and constructed in an impressive Bhutanese stye. You'll find ornate paintings and tapestry from Bhutan among the treasures. The monastery is open to visitors daily except 12 noon—2 p.m. While enjoying the grounds and art, you may be privileged to hear the monks praying. Chhath is huge in Bihar. The 6-day festival is one of the most important aspects of Bihar culture as the Sun and his sister are worshipped and lavishly celebrated. There are processions, prayer, and bathing in the Ganges. People come from all over the world to see the colorful festivities. Dates for the festival vary but occur sometime during the month of October or November. When visiting India, shopping for folk art is often high on the visitor's list of things to do. Madhubani Art, also known as Mithila painting, is done by with the artist's fingers, and with twigs, pens, brushes, and matchsticks. This folk art, part of the Bihar culture, features colorful geometrical designs and images representing aspects of rituals. Chhau is a type of dance that can be seen in Bihar and is primarily performed during festivals. In the traditional dance, the participants wear masks and colorful garb as they perform athletic dance moves. Traditionally, the dancers are all male and perform primarily during spring festivals. Chhau emerged from a combination of classical Hindu dances and the traditions of ancient regional tribes. The Mahaparinirvan Express, named after the journey of Buddha, is a special train that takes people on a tour to visit Buddhist places in North India. The stops include some of the most popular Buddhist sites in Bihar like Rajgir, Gaya, and Nalanda. The tourist train, with amenities such as fine dining meals, offers an eight-day, seven-night spiritual tour. Bhagalpur is one of the largest towns in Bihar and is known for its silk products. You can purchase scarves and sari material made in Bhagalpur. There are temples and ruins to visit in the nearby area. About 40-kilometers away, you can visit the ruins of the ancient University Vikramashila, one of the oldest Buddhist universities in the world. There is a museum with statues and artifacts inside.